Once again, I chose to wear my goldenrod jeans and I opted for a sweater on top. 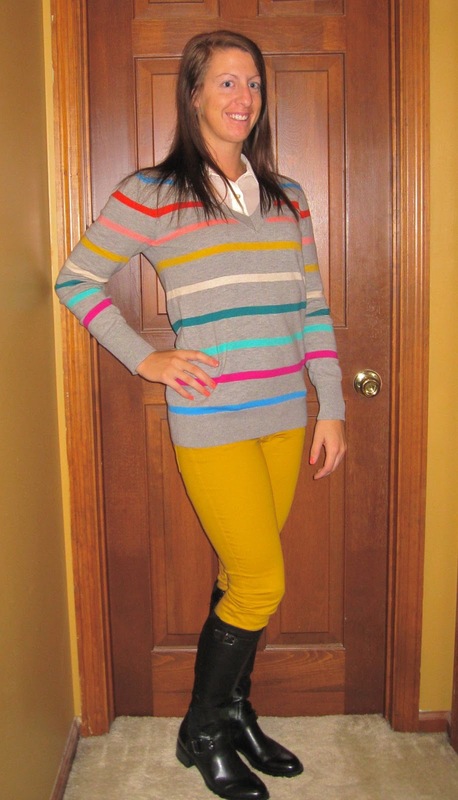 The sweater has several colors on it so it went great with the matching yellow. And because this was a bit loose on me, I threw a sleeveless layering blouse underneath. Riding boots went great with this! I love that you're an Old Navy girl too- yet you mix labels as well :) I'm totally feeling the colors here, the grey breaks it up, so it's not too overwhelming, and the entire look just feels fresh and cozy for Fall.